Gymboree Black Friday sale is starting NOW!!!! These are some of the deepest discounts and some of the best prices offered throughout the year!!! 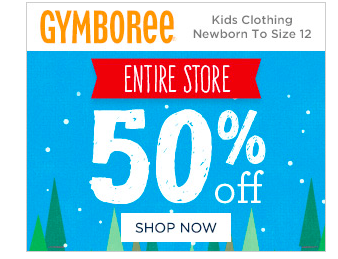 Head on over to Gymboree where starting November 23- November 29 you can get 50% off your ENTIRE purchase PLUS Free shipping, while supplies last!!! AND you can score $8 Leggings and Tees, $10 Gymmies, and $16 Dresses with Gymboree Jingle Deals from November 23- November 29 while supplies last!! !